There may be nothing worse than the feeling of hitting a patch of ice and losing control of your car, or getting stuck in a snowbank. 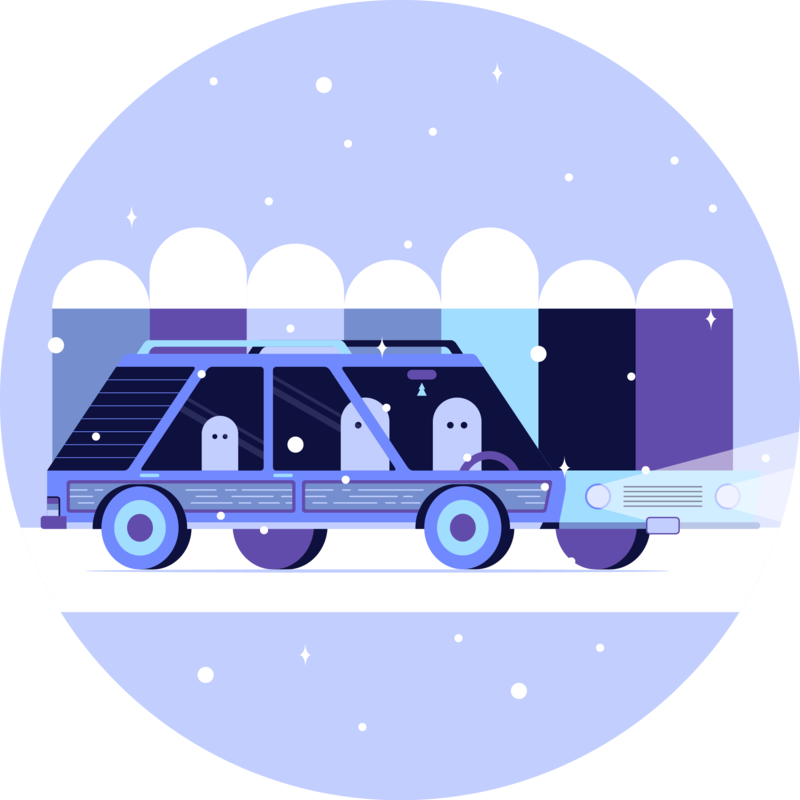 It doesn't take an experienced transportation company to know that safety should be of utmost importance to drivers who plan on being on the road during the Winter season. These 13 Winter driving tips will help you stay safe this Winter. Read it. Make your kids read it. Share it with all your loved ones. If your vehicle were to stall out in the middle of nowhere during a snowy night, would you have everything needed to stay warm and get to safety? Now may be the time to empty out the trunk to make room for some Winter driving survival essentials. Here are the items you should have in your car at all times during the winter. Forgot to take those picnic blankets out of the trunk after Summer ended? If you get stuck for an extended period of time in sub-freezing temperatures, you will be happy you have some blankets to keep you warm. Ice scrapers aren’t just for the morning, when you need to scrape off your car before going to work. They can be an absolute life-saver if you get stuck or stranded. You may run out of washer fluid (more on that later) or your car battery may be running low (and that too). Having a scraper can help you maintain visibility. 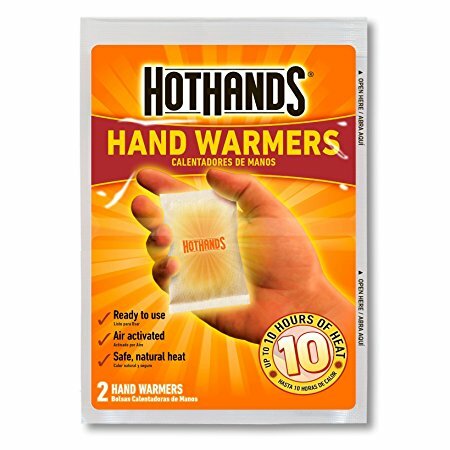 Having hand warmers is along the same lines as having blankets, but it’s doubtful you will find them in the trunk left over from Summer activities. They are cheap and often sold at gas stations. Most cars come with these and they are often in a compartment inside the trunk. If not, make sure you pick it up and keep it stocked. Car batteries get their own section in this guide, so more on this later, but jumper cables are an absolute essential in the winter time. In fact, keeping them in your car at all times instead of the garage may be the best plan of action. You never know when you will need them, but if something happens to your battery, it’s more likely that it will happen during the Winter. Washer fluid is another essential that is often overlooked. Most people have noticed how easy it is to go through gallons of washer fluid every Winter. Like hand warmers, washer fluid can be found at all gas stations, and even most grocery stores during the winter. Most importantly, never use water instead of washer fluid in the Winter, unless you are trying to create an ice rink on your windshield. While it’s unlikely, it’s possible to get stuck in remote areas for extended periods of time during Winter storms. Just in case, bring a bag or two of non perishable dry food when going on a long drive. Trail mix or nuts work great. You may get stranded in the dark with a dead car battery. Your cell phone has a flashlight but that will eventually die too. Stock a flashlight with plenty of replacement batteries to ensure you won’t be stuck in the dark. If you are stranded in an emergency situation, you may need to use flares as a last resort so that people can locate you. Does lighting up a rocket sound a little intense? Not a problem. You can pick up LED flares that are visible from over a mile away. How many times have people advised you to keep you gas tank at least half-full in the winter so your gasoline won’t freeze? The “frozen gasoline” bit is actually not quite true. Gasoline doesn’t actually freeze, but having less gas in your tank on a freezing Winter day can cause other problems. A gas tank that is close to being empty is susceptible to condensation. This condensation can form inside the tank and then re-freeze in your fuel lines, which will prevent your car from starting. Simply enough, many experts recommend keeping a full tank in the Winter because the heavier weight can help increase traction on slippery days. Overall, it’s not a bad idea to keep your tank at least 50% full at all times in the Winter. Learn how to get out of a snowbank. There’s nothing quite like being stuck in a snowbank the morning after a storm on your way to work. It’s an inconvenience that most of us living in states with tough winters have had to weather, and it happens to the best of us. It may not seem like a big deal in most situations, but you could get stuck in a snowbank in a remote location. Knowing how to get out is an essential for Winter driving safety. This is where you pull out the trusty shovel in your trunk and make sure than any snow blocking your car’s clear path out of the snowbank is removed. This includes your windshield, exhaust pipes and headlights. If it’s dark out, keep your headlights on and clear them of snow so that people can see what you are doing. The best substances for this are salt, sand and kitty litter. Most people don’t drive around with sand and kitty litter in their trunks, but it’s not a bad idea for people who drive around in snowy and icy conditions to always have a bag of salt handy in the trunk. This will help melt the snow and provide traction to your tires. The lower the gear, the more traction you will have. And 4 wheel drive is pretty self explanatory: The more wheels are working to get out of the rut, the easier it will be. 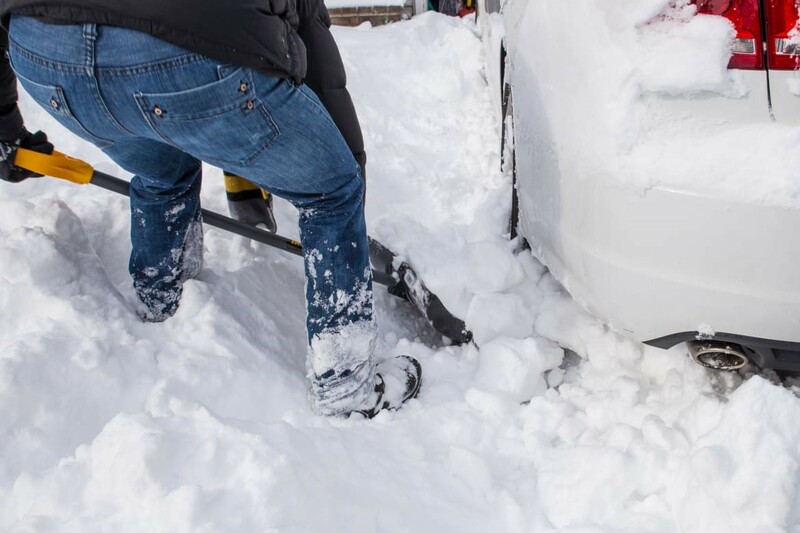 If your wheels are straight, your car has a clearer path to get out of the snowbank and will have more momentum than if you are trying to turn. Get in the car and begin rocking forward and backward a few inches at a time. As you rock, your vehicle should build momentum and gain more and more traction. Eventually, you should be able to pull all the way out of the snowbank. Make sure you don’t spin your tires! This will only dig you deeper into a hole. You never have to worry about a snowbank again! Read up on Winter road conditions before leaving the house! The best way to avoid a dangerous Winter driving situation is to know what to expect. Knowing a huge blizzard is coming may deter you from going on that long drive you were planning. Most importantly, knowing what to expect will keep you prepared and safe. Pick the state through which you will be traveling (or multiple states, if you are planning a longer drive). When you click on a state, you will be taken to the 511 site for that particular state. All of the sites are slightly different, but for the most part, you can find the same type of helpful information on them. When you land on the site, you can look at the state as a whole or pick individual metropolitan areas. The key at the bottom of the screen will help you determine whether or not the current conditions are advisable for driving. You can then click on an individual freeway to see specific weather information at different points along the road. This way, you will know exactly where the bad weather is at all times. 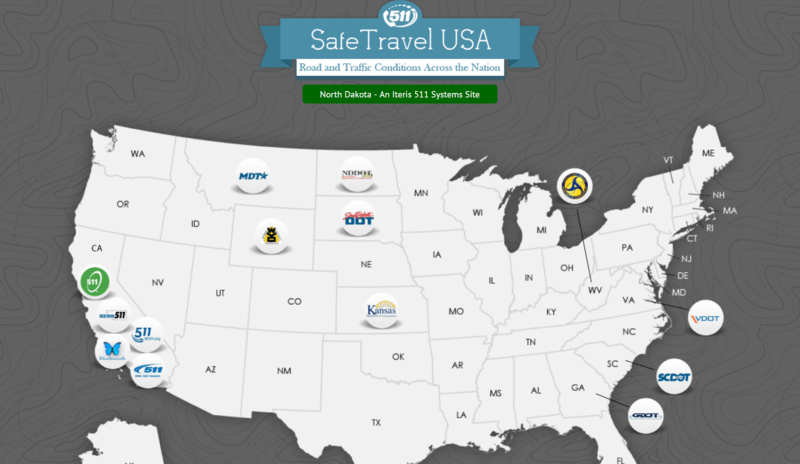 Check out The Ultimate Stated-by-State Midwest Road Work Resource Guide, for traffic, weather and road work updates across the Midwest. Unfortunately, a car or truck is not something you can buy once and ignore. Cars need maintenance in order to stay in working order. Most importantly, they need maintenance to keep drivers and passengers safe. This is particularly pertinent in the Winter time, when an ill functioning vehicle can be extremely dangerous. Here’s everything you need to know about annual car maintenance. If you follow these steps, you will be ready to go this Winter! Place it between your fingers and dunk George Washington’s head directly into the tread of each tire. Based on how much of Washington’s head is showing, you will know how much tread is left. 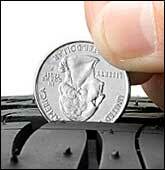 As a rule of thumb, if the tread reaches Washington’s head, you have plenty of tread left on your tire. If not, it may be time to replace them. 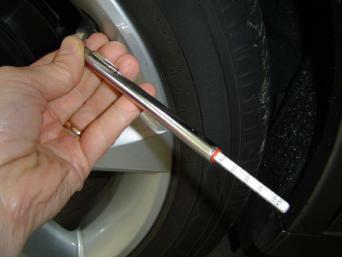 There are many reasons why checking your tire pressure is extremely important. For one, gas mileage is reduced significantly for each PSI (pound per square inch) your tire pressure drops beyond the recommended level. Having adequately inflated tires can reduce your trips to the gas station. Most importantly, low tire pressure can have a huge impact on your safety, particularly in the Winter. This will vary based on make and model. Remove the end caps from the air valves of your tires. If the reading is above the recommended pressure level, push in the valve to let out air and re-measure until the reading hits the recommended level. If the reading is below the recommended pressure level, fill with air until the reading hits the recommended level. Once you’ve returned your tire pressure to recommended levels, you will be well equipped to hit the road. 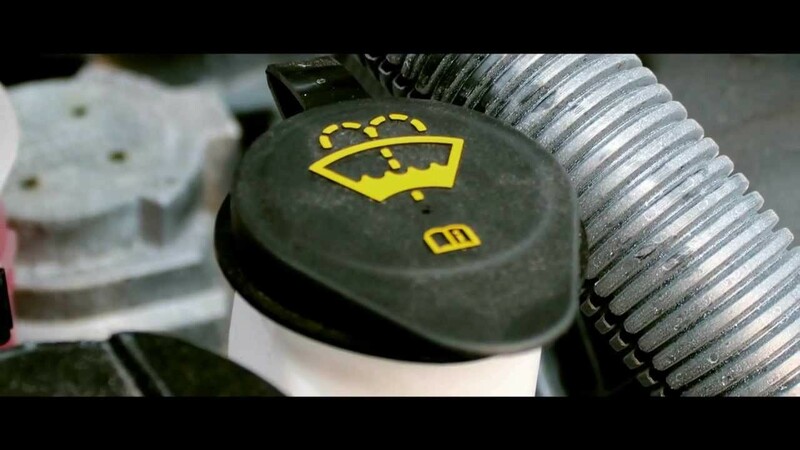 The radiator in your car cools your engine, but it needs coolant (antifreeze) in order to function. If the coolant is below the line, add a 50-50 mix of water and coolant until you hit the “full” line on the reservoir. Believe it or not, windshield wiper blades don’t last forever. 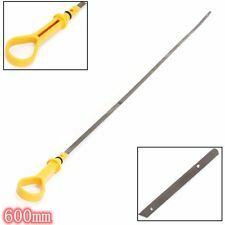 In fact, it’s recommended that drivers replace their wiper blades every 6 months to 1 year. We’ve all experienced the streaking and skipping of old, inefficient wiper blades. In a Winter storm, having your wiper blades replaced could be the difference between safe visibility and having to pull over because you can’t see through your windshield. 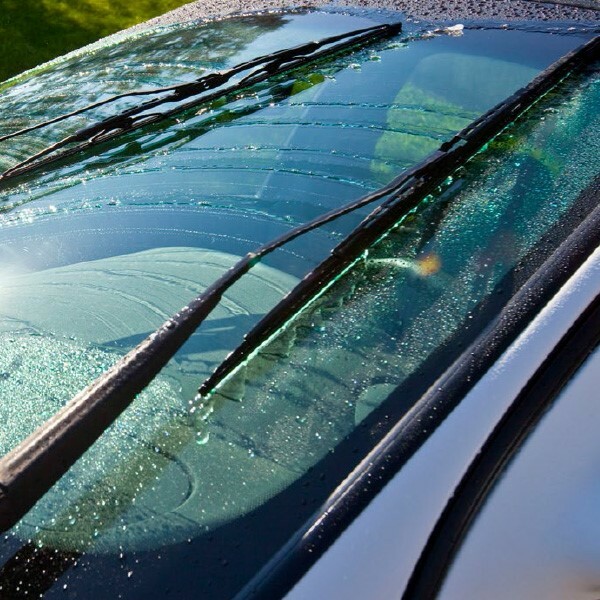 Wiper blades are inexpensive and can be purchase at all auto body and repair shops, and at most gas stations. This is the easiest of them all. Every gas station has cheap washer fluid. Pick some up, pop your hood and top it off. You would be surprised how quickly a car can go through an entire gallon of washer fluid in the Winter time. Your engine oil is vital as it serves to lubricate internal parts of a vehicle’s engine, keeping them from wearing down. It’s recommended that a vehicle receive an oil change every 3-5,000 miles. This will give the car a longer life and you will avoid those pricey trips to the shop every time a small engine part you’ve never heard of stops working. What people often forget, however, is that engine oil level needs to be checked regularly in between oil changes. Every dipstick has a different way of showing high and low levels of oil, but there will always be hash marks or small holes that your oil level should be within. If your oil level is within the two hash marks or holes, there is no need to add oil. Be sure to purchase the type recommended for your vehicle. 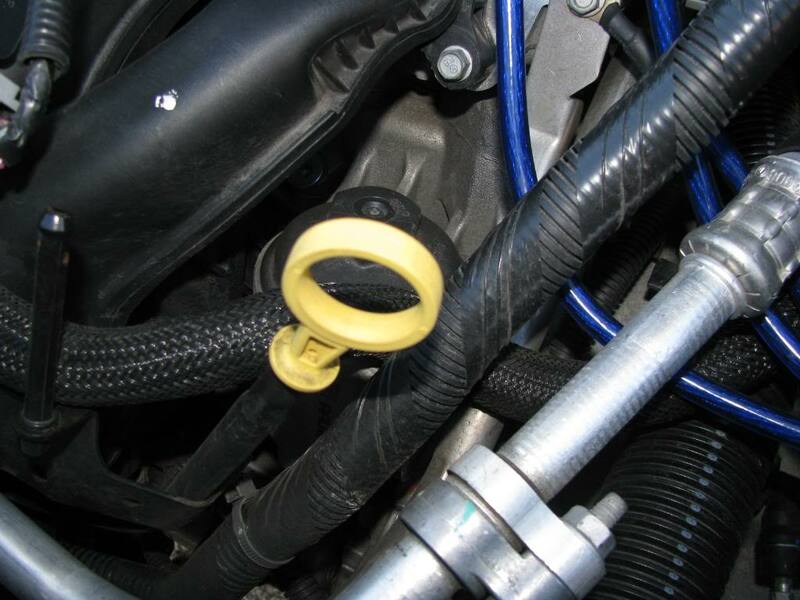 The filler cap is often located above a vehicle’s engine and will often say “engine oil” on it. If the oil level is just right, then you are good to go. If not, keep pouring in oil a little at a time and checking the dipstick until the oil has reached an optimal level. It doesn’t hurt to check in on your car battery once a year, regardless of whether you are experiencing problems. In fact, this step is so important that tip #6 (up next!) goes into detail on how to do it. Temperature can have a huge impact on your car battery’s life and performance. 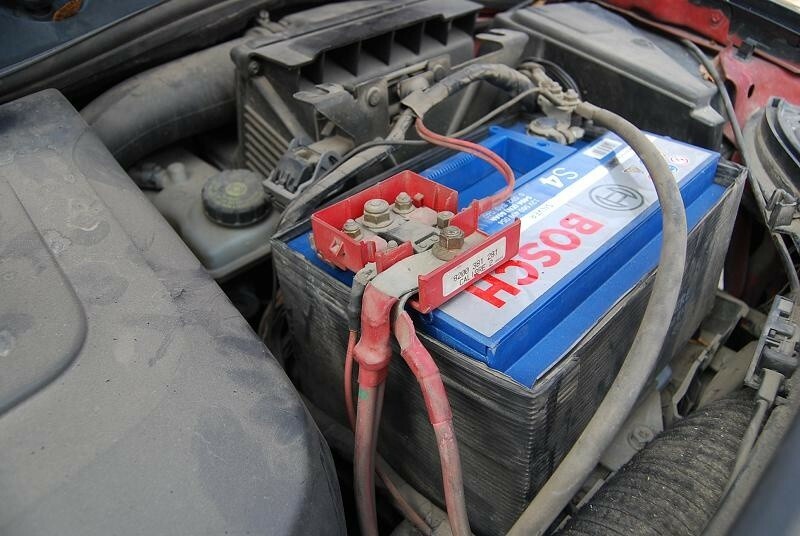 If you’re going on a long drive, it may be smart to check the charge of your battery beforehand. First, make sure your car is off! These are inexpensive digital devices that are used to check the charge of car batteries. 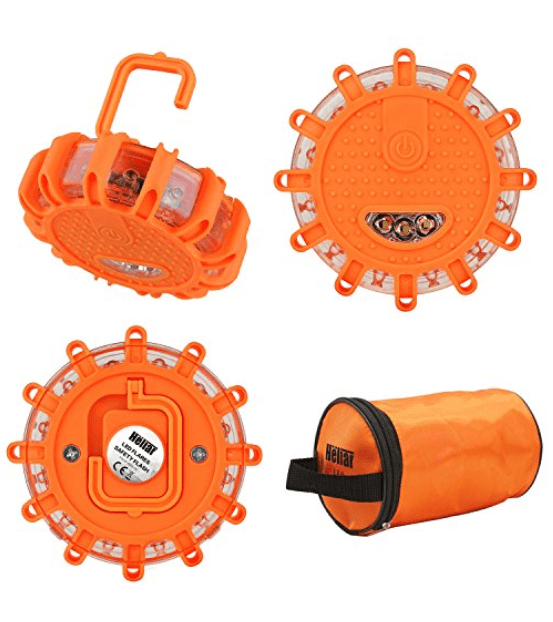 They look like the image below and they can be found at most auto parts stores or on Amazon. Most of the time, it will be underneath the hood of the car. It can be identified as a rectangular box with positive and negative terminals. The positive terminals are usually red while the negative ones are often black. Touch the multimeter’s black lead to the negative terminal and the red lead to the positive terminal. 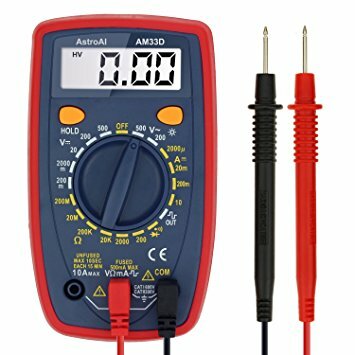 Once your multimeter is attached, it will give you a reading. If your battery is 75% charged or more, you are ready to go! If not, you will need to jump your car. Remember Tip #1? Hopefully you own jumper cables and they are in the car with you. You will need someone to briefly volunteer their car to help you. Pop your hood and have them park so that the front of one car is facing the front of the other. Then pop the hood of your helper’s car and turn it off. Be careful and make sure the positive and negative clamps don’t touch each other. Connect one of the red clamps to the positive (red) terminal of your battery. Now connect the other red clamp to the positive (red) terminal of your helper’s battery. Then, connect the negative (black) clamp on that same side to the negative terminal of your helper’s battery. Lastly, find an unpainted metal surface on your vehicle and connect the negative (black) clamp to it. Start your helper’s car and wait a couple minutes. Try to start your car. After you jump your car, the battery will continue charging as you drive. If your battery will not hold a charge, you may need to take it to the shop to have the battery replaced. If you have driven in a state with cold winters, chances are you have been bombarded with warnings about black ice. For as many people who warn you about black ice, there are about as many definitions of what it actually is. 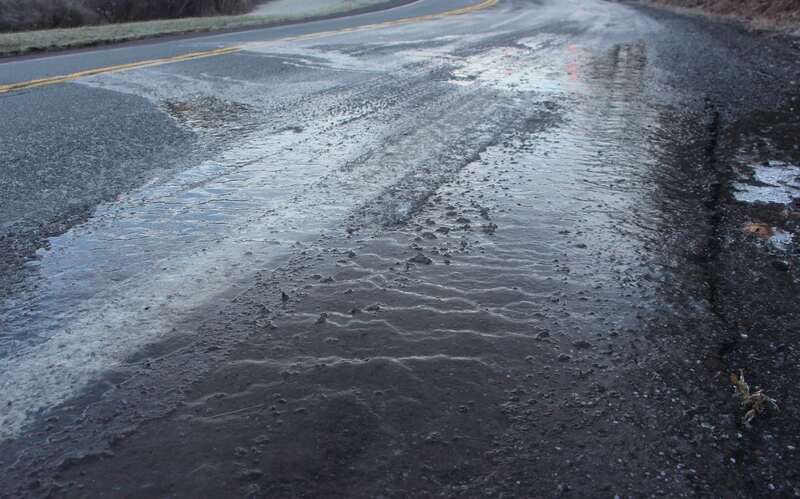 Black ice is formed when the temperature is 32 degrees or below and there is rain falling. Because the temperature of the rain is just above freezing and the temperature of the air and ground are just below, the rain freezes on impact with the ground, creating a thin layer of ice. Black ice can also be created when there is a slight change in temperature above freezing, causing snow to melt. Often overnight, the temperature will jump below freezing again, causing the melted snow to freeze and create black ice. Black ice is not actually black. It’s called black ice because it’s a thin layer of clear ice that often forms over roads, giving it a shiny black appearance. Because black ice tends to form when there are small fluctuations above and below 32 degrees (and often when it is raining), drivers should be particularly cautious during these times. The only other way to spot it is to drive carefully and look closely. Now that you know what black ice is and how to spot it, it’s important to understand how to react if you end up encountering it. Your first reaction may be to slam the brakes and adjust your steering. This will only make matters worse. Avoid using the brakes, but make sure you take your foot fully off the accelerator. Your car will naturally slow down. If you have a manual transmission, you can also try down shifting, as a lower gear will give you more traction. Odds are if you are slipping on a patch of ice, there are also non-icy areas of the road. You may also find an area covered in a layer of snow. Aim to drive over those areas without oversteering and your car will slow down. If you fully lose control, gently pump the brakes and steer toward where you want to go. Eventually, the patch of black ice will end and you should regain control of your car. Have the right tires, and check them! Not all tires are created equal, especially if you live in an area with high seasonality and rough snowy winters. We’ve shown you how to check your tire pressure, but what if you don’t have the right tires for Winter in the first place? When it comes to picking tires for the winter, you have a number of options, ranging from rolling with your standard tires all year long (not recommended) to switching your tires seasonally from Winter to Summer. 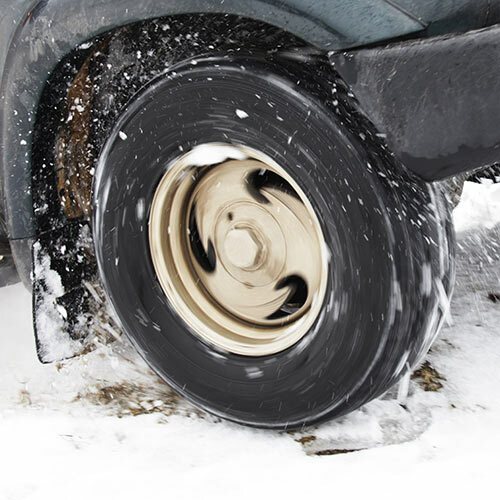 Winter tires are designed specifically to provide traction and durability during the Winter months. They are hands down the best type of tires that you can have on your car during a cold, snowy or icy winter. Pros: These tires will keep you safest in a cold winter because they are designed for cold temperatures. Cons: They need to be replaced after the Winter because they will wear down in warmer conditions, which they are not designed to withstand. All season tires are essentially a compromise, in that they work fine in both cold Winters and hot Summers. Pros: They don’t need to be replaced seasonally because they work year-round. You also don’t need to purchase two sets of tires. Cons: While all-season tires are designed to perform year-round, their performance is never as good as it would be if you were to outfit your car with Winter tires in the Winter and Summer tires in the Summer. Many people with front or rear-wheel drive choose to only purchase two Winter tires and leave the other two as is. Pros: You will have Winter tires on your most important wheels, and you will only have to replace 2 tires seasonally. Cons: Your car will not perform the way it is supposed to because it has two different types of tires. You will also wear down the two normal tires more than their counterparts, which will still have to be placed on the car following every winter. Ultimately, if you have the ability to do so, going with four winter tires is the way to go. This way, you will be ensuring that your vehicle is always outfitted with tires that optimize its performance and maximize your safety. If you just can’t swing it, and you don’t feel like swapping your tires seasonally, purchasing all-season tires is still a good solution. Mixing two types of tires or keeping summer tires on in the Winter is not recommended, as it can cause poor performance and reduce your safety as a driver. While tips 1-8 have helped you learn what to keep in your car, how to prepare it for Winter, and how to prepare yourself for safe Winter driving, tips 9-13 focus on hard skills you will need to have in case you find yourself skidding, fishtailing, or stuck in the snow. Read on to learn about how to stay safe when you encounter common Winter driving scenarios! Click here for more actionable resource guides in the world of transportation and logistics! Learn how to avoid wheelspin. Wheelspin happens when a driver is trying to accelerate with more power relative to the amount of traction available to the car. In other words, if your foot is on the gas pedal, but the wheels don’t have enough traction to move the vehicle at that same speed, they will spin. Depending on how your vehicle is powered (front, rear or all-wheel drive), the non-driving wheels will not move because the driving wheels have no traction, so the vehicle will be stuck. First of all, you are most likely to avoid wheelspin if your car has all-wheel drive or is designed for off-roading, because you have double the chance that at least one of your wheels will find traction. You will be tempted to hit the accelerator if you are crossing over an area of low traction. Don’t. This will only increase the odds of your wheels losing traction. Slowly take your foot off the accelerator and allow your wheels to regain traction. When your wheels have regained traction, you can slowly hit the accelerator to power through the area. If you have a car with manual transmission, you can also try to downshift. This will help you avoid wheelspin as a lower gear typically offers better traction. Learn how to avoid wheel lockup. Wheelspin happens when you accelerate too fast for the surface you’re on. Wheel lockup is the exact opposite. It happens when you brake too quickly for the surface you’re on and your wheels lose traction. Most of us have experienced that scary feeling when we try to brake on a snowy or icy road and our brakes seem to stop working. 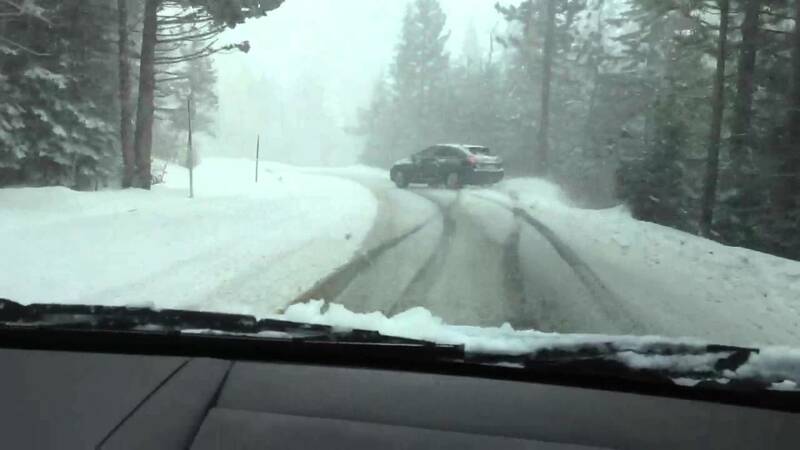 As a rule of thumb, never slam on the brakes when you are on an icy or snowy road. There is a high likelihood of losing control. Instead, ease your foot onto the brake slowly if necessary. If your car has an Anti-Lock Brake System (ABS), wheel lockup should not be an issue. With ABS, you don’t have to pulse the brake, as the system will automatically do this. 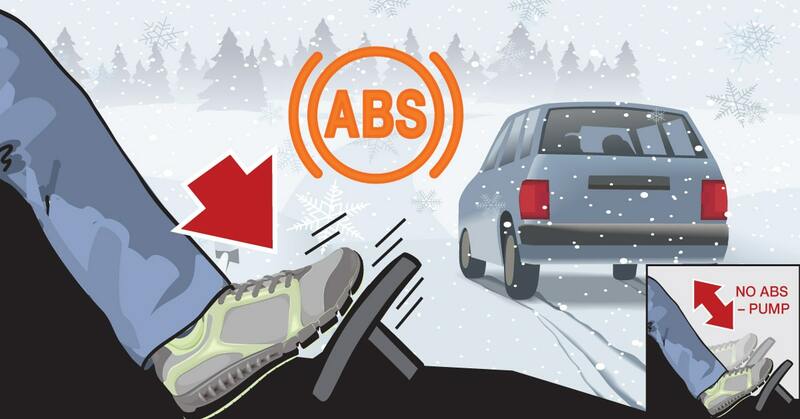 However, ABS has been shown to increase stopping distances in instances when road conditions are slippery, so keep that in mind if you are driving through an icy or snowy patch in a car with ABS. Understeer happens when your vehicle is going too fast to make a particular turn and wants to go straight instead. Specifically, understeer occurs when a car’s front tires lose grip. Have you ever accidentally missed a speed limit warning sign before a sharp turn and noticed how hard it is to make the turn safely at an elevated speed? Well, doing this in snowy or icy road conditions is even more difficult. First, take your foot off the gas. Your car is skidding because it is going too fast around the turn. It’s best to stop accelerating as quickly as possible. Next, gently hit the brake and look in the direction you want to go. The term “understeer” is actually a bit misleading you as the driver are steering in the direction you need the car to go. The issue lies in the car not cooperating because of elevated speed. Keep in mind that by ceasing to accelerate and gently braking, you are decreasing the car’s speed, which should increase the car’s ability to go in the direction it was intended to go. By overcompensating, you will create a situation that will cause you to completely lose control. Oversteer occurs when a vehicle’s rear tires lose control during a sharp turn. Like understeer, most often, oversteer happens when a vehicle is going too fast around a turn and loses control. The main difference is that the vehicle is overcompensating for the turn, and the back end of the car loses control instead of the front end. It tends to occur most often in rear wheel drive cars but can happen in all types, especially in Winter driving conditions. In rear wheel drive cars, where oversteer tends to occur most often, the solution is as simple as removing your foot from the gas while looking and gently steering toward the direction you intend to go. If you experience oversteer in a front wheel or all wheel drive car, it is most likely happening because your car is going too fast for the turn and you are braking during the turn to regain control. In this case, remove your foot from the brake, gently hit the gas and gently steer toward your desired destination. Avoid the countersteer (or fishtailing). Fishtailing, put simply, is a loss of traction of the rear wheels that causes the rear of the car to skid back and forth. It is similar to oversteer, but is actually a direct result of failing to adequately correct oversteer when it occurs. When a driver encounters an oversteer skid and is either too late to correct the skid or overcorrects to the skid, fishtailing often ensues. Fishtailing can be very dangerous because as your car skids back and forth it gains momentum, eventually building enough power in a skid to take your car off the road if it is not corrected soon enough. In a rear wheel drive car, take your foot off the gas and gently steer where you want to go. In a front or all wheel drive car, remove your foot from the brake, gently hit the gas and regain control of the car’s steering. 13 tips for ultra-safe winter driving. Be sure to keep this guide on hand and take these safe driving tips to heart. Open it up as a refresher each time you’re planning on a embarking on a long drive in the Winter months.